DIVA is an easy-to-use app designed to make your life more productive and successful. Hopefully, you’ll find it easy to use. On these pages, you’ll find complete instructions about every component in the app… There’s a LOT of bells and whistles, although because of space limitations on mobile devices, some are a bit inconspicuous. When you FIRST use the app, your first stop should be the Settings module, where you set your preferences that affect every portion of the app. The main screen is shown to the left. That’s your starter screen, and from there, you go to all of the other functions in the app. The Exit button is self-explanatory so it won’t be discussed. Clicking it closes the DIVA completely (except for the Service that runs to check alerts at specified intervals). 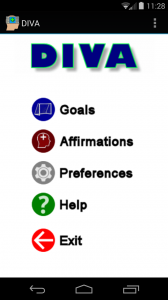 When you open the app, after several things happen based upon your settings, this is the screen at which you’ll land, and it’s your Goals and Affirmations control panel.